If you’re in the market, there are 4 types of garage door styles that our experts here at American Garage Door in Denver want you to know about. Of course, within these four types, are color combinations and customizing features that make the possibilities virtually endless! These days, garage doors offer a great way to jazz up the appearance of your home. They’re no longer just a functional piece of equipment, but create instant curb appeal and add value to your home. 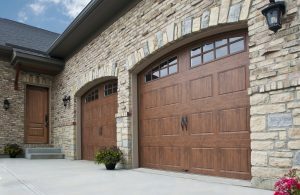 Traditional, residential garage doors are versatile and go well with nearly every major American house styles. For example, they can be combined with Victorian, Ranch, Cape, Colonial or Craftsman style homes. They even work well with many European styles, such as Mediterranean, French Country, Tudor or Spanish. These doors typically have horizontal panels that roll upwards to open and can be ordered in a huge variety of colors and materials to create the perfect look. Carriage garage doors are built to imitate the look found on old carriage houses from the horse and buggy days. However, the look is classic and can go well even with some contemporary style homes. Traditionally, these doors swing open manually from the center. Nowadays you can find automatic openers that will fold open the doors while maintaining the charming look of the traditional doors. Raised-panel style doors is an extremely common and practical style. They are so common, in fact, that when most people picture a garage door, this type is what they think of. However, there is still a lot of versatility within this kind of garage door style. Also, due to their popularity, it is easy to find one in just the right material and color combination you’re looking for. These are also usually horizontal panels that roll up onto overhead tracks. Ultra-modern, contemporary style houses with their sharp edges and clean lines need a contemporary style garage door to perfectly accent their home. Contemporary designs vary, of course, but one popular design is tempered glass panels in aluminum frames offering a slick, clean look chic enough for any modern home. The aluminum frames can be painted any color you like to perfectly complement the look of your home. Just like many contemporary house styles actually encompass elements of a retro look, there is a popular contemporary/retro garage door style that is gaining ground. Instead of horizontal panels that roll up, this retro look is comprised of one big slab panel that swings up to the ceiling. We hope that this overview of 4 types of garage door styles has been helpful as you begin your quest for the perfect garage door. If you are still unsure about the exact style you want or need some design advice from a professional to help you choose the best complement to your home, you can always talk to the experts here at American Garage Door. We offer on trend style advice and efficient, effective installation services. Serving the entire Denver metro area, we’re here to help.